2017 marks the 200th anniversary of the death of Jane Austen, whose six completed novels have never been out of print. Best known for her novels, ‘Sense and Sensibility’, ‘Pride and Prejudice’, ‘Mansfield Park’, and ‘Emma’, first published anonymously, Jane commented, critiqued and illuminated the life of the English upper classes. But did Jane’s writings highlight anything about her own spirituality? In this celebratory book, Paula Hollingsworth explores Jane Austen’s gentle but strong faith and the effect it had both on her life and her writing. Drawing on Jane’s life story, her letters, her friendships, her books and the characters portrayed, Paula shows the depth of Jane Austen’s spirituality. Jane Austen has long been one of my favourite authors, so when I saw The Spirituality of Jane Austen by Paula Hollingsworth on NetGalley I was keen to read it. It’s a combination of a biography, which complements other biographies that I’ve read, and an analysis of Jane Austen’s works from the point of how they reveal her spirituality. With this definition in mind Paula Hollingsworth then considers Jane Austen’s letters, her early writings and novels, focusing on how they reveal Jane’s spirituality implicitly rather than explicitly, seeing parallels between her life and her writings. I enjoyed this way of looking at her novels in particular. I think the last chapter in which Paula Hollingsworth considers modern adaptations and dramatisations of Jane Austen’s books is very interesting. Whilst they have brought her work to a wider audience it has meant that character development has been lost, or the values of the times in which the novels are set have been changed to make the story more acceptable to a modern audience. And given that Jane Austen disliked Bath when she lived there, Paula Hollingsworth believes she would be disappointed by the focus on some of the activities and merchandise rather than on her books. 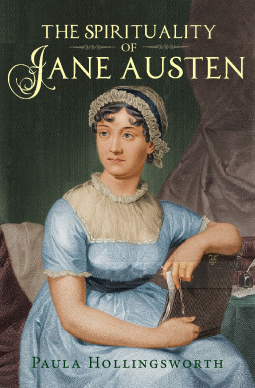 She also considers the recent Austen Project books in which modern authors set the novels in the present day and the problems they have in making them credible to modern readers. She describes the many ways people today can enjoy Jane Austen’s work, such as watching screen adaptations, dancing at a Regency Ball, reading books about Jane Austen and her world, dressing in Regency costume and parading through Bath and other events, but considers that the best way is to read the novels themselves and to read them slowly. I agree. I really enjoyed reading this book and it has made me want to re-read the novels, particularly those I haven’t re-read recently. There are comprehensive notes on the chapters, an appendix of Jane Austen’s prayers and a select bibliography. My copy is an ARC I received from the publishers, Lion Books via NetGalley. The paperback (240 pages) will be published on 24 March 2017. Oh, this sounds both interesting and informative, Margaret. I think most writers’ beliefs come through in their work, at some point, and in some way. No reason it should be different with Jane Austen. I would definitely like to read this book, Margaret. An interesting and slightly different consideration of Jane and her legacy through a fascinating lens. I like the fact that the author has brought her lens to bear on the very latest interpretations of Jane’s books. Thanks for the clear and helpful review.